Last week I performed surgery on a patient for gout. Well, for a gouty tophus actually. Gout is a metabolic disease that requires pharmacological treatment and diet changes, not surgery. Surgery is, however, indicated for the symptoms that go along with gout. First I will tell you a little about gout in layman’s terms, then I’ll discuss complications of gout in the foot and finally gout surgery. Gout is a metabolic disorder in which there is too much uric acid in the blood. This can come from: taking in too much protein that is broken down into uric acid; the kidney not being able to process enough uric acid to excrete it in the urine; and thus uric acid builds up in the blood, or less commonly, the body producing too much uric acid. Uric acid in the blood comes from the breakdown of purines from our diet. Purines are part of proteins and are more abundant in some foods than others. The biggest offenders are shellfish, organ & red meat and legumes (beans). Alcohol intake competes in the kidney and makes the kidney excrete less uric acid than normal. Once we intake protein, it is converted to purines and pyrimidines and the purines are further broken down in uric acid and other byproducts. The uric acid is removed from the blood by the kidney. When not enough uric acid is removed, it builds up. High uric acid alone does not cause symptoms, however, it can effect the kidney. Being a podiatrist, I’ll skip the systemic effects of gout and talk about the manifestations in the foot. What is an acute gout attack? An acute gout attack in the foot occurs when the uric acid comes out of the blood and into the joints, usually the great toe joint of the foot. If you think real hard and try to remember back to high school chemistry, a liquid can only hold some amount of a solid dissolved in it. Once it reaches its saturation point, it cannot hold any more. Another fact about solids dissolved in liquids is that a warmer liquid can hold more solid dissolved in it than the same liquid when it is cold. Picture dissolving sugar in hot coffee which goes pretty easy, versus trying to dissolve sugar in cold water. Going back to gout and stop reminiscing about high school, uric acid is the solid and blood is the liquid. When the blood gets further away from our core and into the extremities, it gets cooler. The warmer blood that was holding all of that uric acid dissolved in it can no longer hold all of it. For unknown reasons, the uric acid then comes out of the blood and into the joints as a solid in the form of a solid crystal. These uric acid crystals are called negative biorefringent crystals because of how they reflect light when looked at under a microscope, but that goes beyond the scope of this article. When these uric acid crystals enter the joints the fun begins. The body mounts a major immune response as these crystals are not supposed to be in there and are looked at like a foreign body. This is what is called the acute gout attack. Symptoms of an acute gout attack are usually severe pain in and around the joint. The joint appears angry. It gets red, hot and swollen. Any light touch or motion hurts. Many people tell me that the pain starts at night and just the pressure from the bed sheets hurts. Often people present with symptoms that mimic an injury but cannot recall any trauma. Often gout is also confused with the red, hot swollen symptoms of infection but there is no open sore or injury where bacteria can get in. Most of the time I diagnose gout based on history and symptoms. Again, red, hot swollen, painful foot joints without history of trauma or infection. Most acute gout attacks occur in the great toe joint and other joints of the foot and ankle. The next most common joint affected is the knee, however, gout can occur in any joint in the body. Most of the time when I suspect gout, I will do a blood test to measure the serum uric acid, however, this is not always a great test. Often the serum uric acid is normal even during an acute gout attack. When the uric acid blood test is normal you cannot exclude gout as your diagnosis, however, if the serum uric acid is high then you do have your diagnosis. Medically, we call this a false negative when the uric acid is normal but it really is gout. We also say that this blood test “can rule gout in but cannot rule out gout”. The most accurate way to diagnose gout is to pull fluid out of the painful joint with a rather large needle. I rarely do this because it hurts a lot. 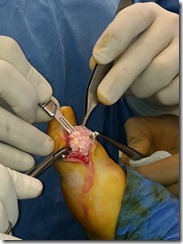 Also, the great toe joint is a small joint with very little fluid and it is really hard to get any fluid out of it. When fluid is taken out of the joint, the pathologist looks under a microscope to see if there are uric acid crystals in it. Normally there are none so if he/she sees any, you definitely have gout. The first line of treatment is anti-inflammatory medications. The old anti-inflammatory medicine used is Colchicine. Personally, I rarely use colchicine but it is still an acceptable treatment method used today. The reason I don’t use colchicine is because it causes side effects. Patients are told to continue the colchicine until either they vomit or have diarrhea, whichever comes first. Both not very pleasant sequelae. Instead of colchicine, I use Indomethacin (aka Indocin). Indomethacin is in the same class of drugs as aspirin or Motrin but is stronger. For unknown reasons it works better on gout attacks than other anti-inflammatory drugs in the same class. Other anti-inflammatory drugs work well too, but I find Indomethacin to work the best. I prescribe Indomethacin 50mg, one by mouth three times a day for the first 4-5 days, then twice a day for up to 7-8 days. It is taken with food. I tell patients to stop it when the pain subsides or they reach 7-8 days and then follow up. When people cannot tolerate Indomethacin because of stomach problems, I usually prescribe Celebrex. Celebrex is in a class of anti-inflammatory drugs called Cox-2 inhibiters. These drugs have less adverse effects on the stomach. Another treatment is steroid injection into the joint. I do this when the symptoms are really severe. The steroid injection is a very strong anti-inflammatory, placed exactly where the inflammation is. It works almost immediately usually to resolve the pain. Unfortunately, it hurts going in. I have to stick a needle into an already painful, inflamed joint. Oral steroids also work well but have more side effects than the Indomethacin. Icing the painful area will help as well. Resting the effected joint with decrease pain too. Long term treatment involves oral medications to prevent the build up of uric acid in the blood. Again, as a podiatrist, I will skip this as it exceeds the scope of my blog post. One thing I will write about this is, do not take these uric acid lowering medicines while in the acute stages of gout as they often make the gouty attack worse. 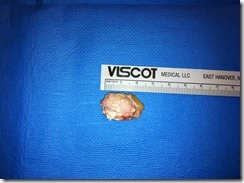 Below are pictures of the gouty tophus that I took out. This is the result of many years of build up of uric acid in and around a joint. And, lastly, below is a picture from a different surgery. This is a picture of uric acid crystals, gouty tophus, I encountered when doing bunion surgery. I did not expect to see this as they patient never had a history of any gout attacks, however, apparently, he had chronic gout and did not know it. What are Hammertoes? 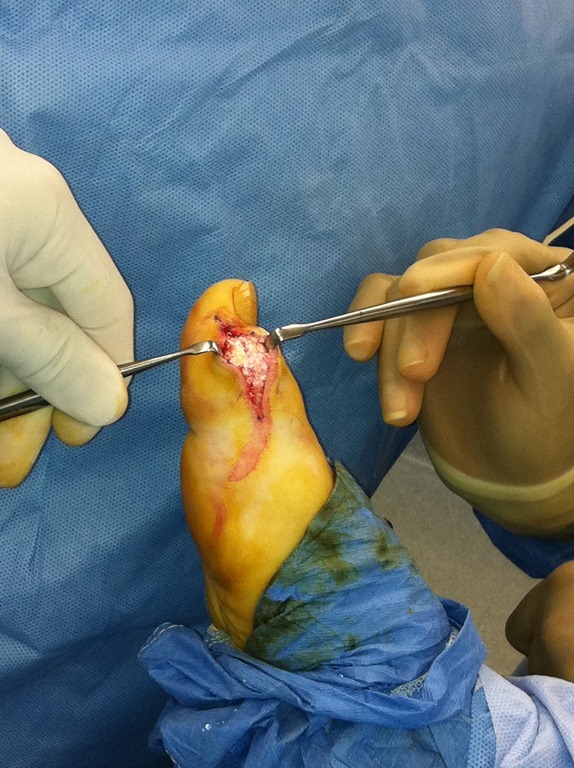 Prevention and Hammertoe Surgery. 23 Responses to What is gout? and… Foot surgery for gout. As a Gout Patient, I found your BLOG interesting and educational! Having Kidney problems keeps me from taking the various medications recommened! I take Uloric, which is supposed to keep the Uric Acid under control. Thanks for the comment Mom! Everyone, meet my mom who unfortunately suffers from gout. Uloric is one of the newest and best medications for chronic gout. It acts to block the chemical pathway in the production of uric acid. It does not, however, treat an acute gout attack. Gout can really be a serious problem if not diagnosed early. This is a really nice post and tells almost everything about gout. Hi Laura, I’m glad you liked my post on gout in layman’s terms. My father suffered from gout about 6 years since 2005 and recently getting severe. I just read from a website that sodium bicarbonate (baking soda added to water) can help reduce the attack. Is it true or it just a myth?? Im sorry I don’t know about this home remedy for gout. It I doubt it would work. Thank you for this article with the pictures which I found most interesting. I have a condition very similar to this and have had two medical opinions both – diametrically opposite – the one doctor saying doctors are reluctant to do these ops because of the long healing period taken for the tow to recover. Could you comment on that please? Sometimes it is harder to heal after surgery when there are open sores caused by gouty tophi. On the other hand, it is almost impossible to heal these open sores when the tophi are not removed. As long as there are no concomitant problems that contraindicated surgery such as peripheral vascular disease, venous stasis or lymphedema or others, then. I usually recommend the surgery to remove the tophi to patients. Talk with your doctor about the risk and reward of surgery. I’ve turned 40 and recently have had numerus gout attacks. I take Prednisone to cure the attack not my choice but works. I have always had real bad bunions and everyone in my family has big bunions(always have to wear wide shoes since i was a kid). 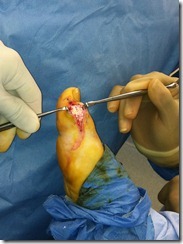 Would possibly getting the bunion surgery help relieve the gout syptoms like in your last surgery example. It is possible that surgery will relieve some of the pain but you also need to address the metabolic problem underlying your grunt attacks. Prednisone is a great drug for gout. It is a very strong anti inflammatory however, I prefer using Indomethacin for acute gout as it has less side effects and easier on the stomach / GI system. Ask your doctor. Fantastic article. I wish you were in my general area (Chicago) so I could see you for a consultation. I have some medical issues like psoriatic arthrtis, and others, one being horrible goat attacks. Personally I believe the gout has caused permanet damage to my ankle and it may well be surgery is my only option. I do take prednisone often for severe attacks when I am unable to even make it out of bed due to the severity of the pain. Is it possible for you to expand on the doses and side effects of oral prednisone? Again, great and informative article. Unfortunately, I can’t answer your question on doses of oral steroids as they are dependant on individual patient needs. The best advice I can give you is to consult an experienced rheumatologist. I was diagnosed w/gout in 06. It was a major attack that another Dr. Thought was a broken toe. But, when my broken toe did not heal, I finally consulted a Podiatrist. She nailed it! An injection in the joint & indomethecin and I was mobile in less than 24hrs. Yeah for Podiatry! I also got the diet,et al. However, she did not tell me about tophi. (I had not even heard the term until I read your article.) Needless to say I was shocked when this big lump appeared on my toe. Now what?? I have heart disease (two stents)and am afraid to take nsaids or ulloric for extended periods. Do your patients w/ CHD do well on ulloric? Is surgery a viable option? To be frank, I would rather amputate the toe than live with this pain. Thanks for keeping people like me informed-you do a great service. Hi JD. Sorry to hear about yr foot pain and comorbidities. Wen pts cannot take systemic gout medication surgery often becomes the only option to treat painful joints. Surgery ranges from removing tophi and bone spurs to fusing joints and removing part of the joint to create space between the bones. Amputation is the last option and rarely indicated for gouty arthritis. Good luck. I have experienced acute gout episodes in my big toe over the past 20 years but in the last couple of years they’ve become more chronic. Usually, treatment with oral or injected steriod type meds. will ease the pain but now I’ve noticed that the joint seems to have enlarged a bit and that using the full range of motion in a normal step is painful and is beginning to effect my gait. My question is, at what point should I consider surgery? I certainly don’t want to get to the point of disfigurement illustrated in your clinical photos. Hi Stan. When to do surgery on a joint affected by gout is hard to comment on without evaluating the paitent. Gout destroys the joint very slowly. Often the amount of pain and frequency slowly increases. As the spin gets worse its a good idea to get periodic X-rays to evaluate. If there are tophi present they can be removed. Also, bone spurs can be removed. Finally when e joint is destroyed more invasive surgery is needed. We try to operate before these bigger surgeries are necessary. 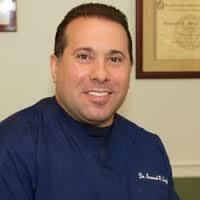 Love your blog; I am in Los Angeles; can you recommend a dr for me to have my gout removed? Thank you so much. It also just attacked my big toe and now I have that paste white stuff and I don’t like it..How can I get rid of that..
Hi. Thanks for reading my blog. I don’t know a doctor in LA. Most foot surgeons should be able to remove gout tophi when they get large and painful. I have just had surgery to both big toes and left little toe to remove gouty tophi, unfortunately I have suffered a severe attack of gout during the healing process about 2 weeks after the surgery, I have read that antibiotics can bring on gout, I was prescribed antibiotics after the surgery and I also contracted a chest infection. Another dr also prescribed antibiotics, m question is has the antibiotics caused my severe gout attack Otis it the result of surgery. It’s impossible to tell for sure the reason for your acute gout attack. It could be any of these vaiarables or others including diet and had hydration. If you had a chest infection, the antibiotics were necessary regardless if they contributed to the gout attack. The ‘stress of surgery’ can often bring on gout too. I really appreciate this blog post about gout. 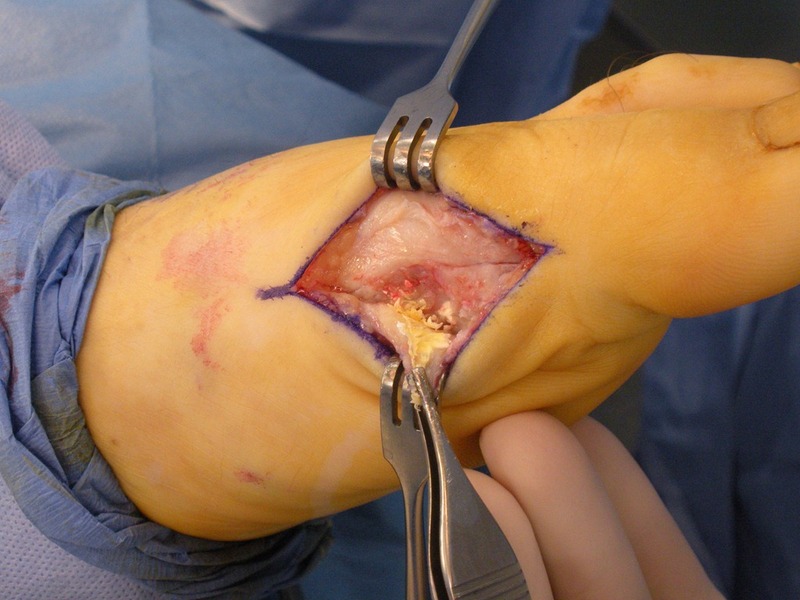 I just had a second surgery on my foot in 3 months (the first was expected – Kidner procedure with flexor transfer). When I wasn’t progressing through PT as expected and severe pain developed, an MRI showed severe inflammation and coalition in the middle facet of the subtalar. 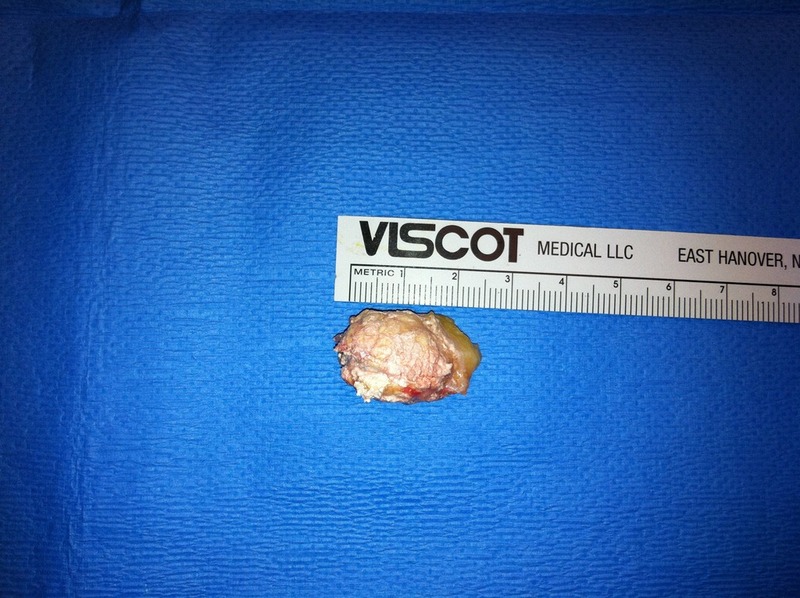 The second surgery on Feb 6 for a subtalar fusion yielded a new surprise – gout crystals (and a subuquent uric acid blood test showing a 7.3) AND an unexpected tear on the PTT hindfoot (ironically, not where the surgeon previously pinned the PTT for the first surgery). The concern is the gout. I’ve adjusted my diet (which wasn’t too bad to begin with), and my Primary Doc just put me on Allopurinol (which I understand can increase gout on a temporary basis). I want to do my best to ensure that this second surgery is successful, and my surgeon (who is a nice guy) is a bit hesitant to give me a straight answer. I’d really love to hear your insight on: 1) Gout affecting the PTT repair and subtalar fusion; 2) Is Allopurinol a bit premature at this stage since it can temporarily increase gout attacks; 3) The use of Indocin during this critical healing phase, if I THINK I have gout attacks. I’d like to use the information you provide to take back to my surgeon and Primary Doc. Thank you for your help!